are in the same judicial race this June. SUPERIOR COURT JUDGE | A contested Superior Court judicial campaign in rare in Alameda County and three in one cycle is unheard of. This year, three candidates are seeking to replace Alameda County Superior Court Judge Lawrence Appel’s retirement in the most competitive race, and two have the endorsement of Rep. Eric Swalwell. 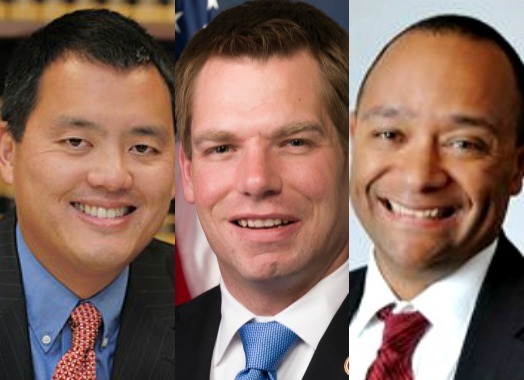 Like Swalwell, David Lim and Scott Jackson have backgrounds as Alameda County deputy district attorneys and are former colleagues. But Swalwell’s endorsements could not be characterized as being split as sometimes is the case. Swalwell, though claimed to one of the candidates, that he was unaware Lim and Jackson were facing each other in the same judicial contest. The excuse sounds ridiculous and could very well be, but among the three open Superior Court spots, several different candidates switched the seat they were running before the deadline last month. Barbara Thomas, the third candidate in the race labeled Number 1, for instance, was initially seeking judicial seat Number 14. That seat was later cleared of Thomas, a former Alameda councilmember, and others, for Piedmont Mayor Margaret Fujioka, who has significantly more backing from the establishment along with greater campaign resources. Another thing to watch in these judicial races is an oddity among other campaigns that forbids negative campaigning and for candidates to express any opinions that could later point to bias on a particular issue, if they are successfully elected to the bench. Posted in Alameda, Alameda County Superior Court, Barbara Thomas, David Lim, endorsement, Eric Swalwell, June primary, Lawrence Appel, Margaret Fujioka, Scott Jackson. Bookmark the permalink.